Yesterday Lou Ann and I joined fifteen other folks for a boat ride to Portsmouth Island and the annual Christmas season bird count. It was chilly out in the sound, but warmer in the village. Being on Portsmouth in the winter is a wonderful experience. As many of our readers know, Portsmouth village has been deserted for more than thirty-five years. When Henry Pigott died in 1971, Marion Babb and Elma Dixon, Portsmouth's last remaining residents, reluctantly moved to the mainland. Today, the Methodist Church, US Life Saving Station, Schoolhouse, Post Office, and several dozen houses and other structures are silent memorials to the thousands of people who have called Portsmouth Island home since 1753. You can read more about Portsmouth Island here. Lou Ann will be writing an article about the bird count in the next week or so. Look for that in an upcoming post. Out latest Ocracoke Newsletter celebrates the majestic live oaks on Ocracoke Island. You can read it here. To read about Philip's new book, Digging up Uncle Evans, History, Ghost Tales, & Stories from Ocracoke Island, please click here. On Saturday Lou Ann and I joined a host of islanders (and a few visitors) for the Working Watermen's annual oyster roast and shrimp boil. Wooden saw horses were set up in the Fish House parking lot and covered with plywood. When we arrived dozens of people were standing around the makeshift tables piled with steaming oysters. They were busy opening the oysters, either downing them immediately, or laying them on plates to take to friends and relatives at the nearby picnic tables. Bowls of cocktail sauce and horseradish competed for space with the oysters, opened shells, knives, saltines, and plates of shrimp. A tub of iced soft drinks was on the ground beside the loading dock, but many people had brought bottles and cans of beer to wash down the oysters and shrimp. Up on the porch "Baby Dee and Free Mustache" entertained the diners with 1950s rock and roll. It was quite the experience! After filling our bellies and visiting with neighbors Lou Ann and I headed for the beach to walk off dinner. Immediately over the dunes we were struck with the sight of a wintertime rainbow. About a football field ahead of us, arcing from the breakers to just behind the dunes, the rainbow formed a tunnel. Knowing better, I walked faster, hoping the laws of physics would be suspended for just a little while so we could duck under the arch and enter a magical world. Of course, the rainbow advanced ahead of us as we proceeded north, but it was magic nonetheless. Only a short distance up the beach Lou Ann stooped down to pick up a perfect sand dollar. It was as good as a pot of gold. This month's Ocracoke Newsletter is a documentation of the many majestic live oaks on the island. You can read it here. Today I published another monthly Ocracoke Newsletter. This month is dedicated to the many majestic old live oaks on the island. Recently I registered six of the largest Ocracoke oaks with the Live Oak Society. You can see photos, read some history, and learn more about the trees and the society by clicking here. Yesterday afternoon at one o'clock family and friends of Zora Bable Gaskins gathered at the Gaskins-O'Neal cemetery to remember him and celebrate his life. Zora was 76 years old when he died early last week, and beloved by his family. Sitting on folding chairs amidst old and new tombstones scattered about, I glanced up at a patch of blue-gray sky framed by gnarled and twisted branches of a dozen live oaks. Lying on a table nearby, surrounded by flowers and photos, were Zora's hair clippers. I was reminded of my dad who died in 2002. Zora would cut my dad's hair, and my dad would cut his. But it wasn't just about cutting hair. When they got together to cut hair it was a social event, for they would stay for hours sharing stories and laughing about their youthful antics. Farewell, Zora. We'll miss yet another old timer who has left us with fond memories. This month's Ocracoke Newsletter is the story of the Artists' Colony that operated on the island more than 65 years ago. You can read it here. Wow, it has been a whirlwind of activity around here the last few days! Family, friends, and food have been a major part of the holidays. Every meal has been an event, with the table piled high with ham (no turkey this year), sweet potato casseroles, corn puddings, home baked bread, broccoli salad, scalloped potatoes, pumpkin pies, cookies, apple crisp, and more. The children presented a dramatic/musical program at the Methodist Church Christmas Eve, we shared presents with David, Amy, Lachlan, and other family and friends on Christmas morning, and enjoyed the company of island friends yesterday at a Boxing Day get together. This afternoon the Fish House will be hosting an oyster & boiled shrimp dinner from 2 - 5. If they do it like in the past they will have picnic tables set up in the parking area, and the property will be filled with islanders and visitors eager to sample the delicious seafood feast. It is very foggy this morning, but that shouldn't spoil the fun. Lou Ann and I are planning to make popcorn and watch "March of the Penguins" with Lachlan about 4 o'clock this afternoon. But when are we going to get to the beach?? Oh well, if not today, then tomorrow. Before I forget, I want to reply to several comments/questions that I received over the last several weeks (sorry it's taken so long). Because of my article about the Ocracoke Artists' Colony I was asked about any possible connection between Theodore and Alice Rondthaler (Ocracoke schoolteachers in the 40s & 50s), Black Mountain College, and the Artists' Colony. I have researched this with a number of knowledgeable folks (including the Rondthalers' daughter) and have discovered no connection. Another reader suggested producing a documentary book based on the concept of "A Day in the Life of Ocracoke." Noted photographer, Al Harvey, has already made hundreds (maybe thousands) of photographs for the project "A Day in the Life of America" which was published several decades ago. Unfortunately, no Ocracoke photos are in the book, but I'm sure Al still has the originals. Maybe he'll be inspired to produce an Ocracoke book. Someone else asked about the red gypsy wagon behind the Village Craftsmen. I built it about 25 years ago, and use it occasionally as a spare room. Don't ask why I built it. It was just a quirky whim! But it is cool! All of us at Village Craftsmen wish you and yours the merriest Christmas ever! We thank you all for your love of Ocracoke, your support of Village Craftsmen, and your continued interest in our on-line journal. Sending wishes for peace and good will to all of you, we are the entire staff of Village Craftsmen. Hi again to all of our readers. I've been off the island for a few days. Went to pick up Lou Ann. She left an Indiana white Christmas (snow, and zero degree temperatures) to spend the holiday on Ocracoke. Right now it is in the mid-60s here, but I understand that it is warming up in Indiana also. We had family and friends over for dinner last night (with much laughter and frivolity), and there is more holiday activity to come this evening, and, of course, tomorrow. As soon as we got to the island Monday night we got our Christmas tree. We decorated it last night amidst the chaos of a house full of people. We also put candles in the windows, stockings on the mantle, and a few white lights around the doorway inside. So things are looking festive. We wish all of our readers a very merry Christmas wherever you may be! It's still fairly warm today (close to 60 degrees), although the forecast is calling for much colder temperatures by Monday (the low 40s), but then it looks like it will be warming up again by Christmas day. So, as usual, Ocracoke is not likely to see a white Christmas (unlike much of the rest of the country). In the meanwhile, Ocracokers are excited about the Christmas holiday, even if it will probably be rather balmy. We hope you've gotten most of your shopping done and will be able to relax and enjoy the season. If you are still looking for holiday gifts you can go to our on-line catalog by clicking here. For important holiday shipping information, please click here. ...is the winter solstice. Because of the tilt of the earth's axis, and its revolution around the sun, we experience seasons here on this planet. The winter solstice (the time when the sun appeared to primitive peoples to "stand still" so close to the horizon) is the shortest day of the year in the northern hemisphere. Years ago I wondered why people would celebrate the shortest day of the year. Eventually I realized that the celebration was not because the days were so short, but for the ending of the gradual descent of the sun in the sky, and the welcomed return of the sun higher and higher in the sky. 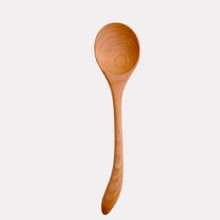 Primitive people did not have precision instruments to gauge the exact date of the solstice, so they often waited several days. Then they could be sure of the change, as they saw the sun rising and setting higher above the horizon each day. Tomorrow is also the beginning of Chanukah, which begins at sundown. Chanukah is the eight-day Jewish festival of lights. You can read more about Chanukah here. If you are still looking for holiday gifts you can go to our on-line catalog by clicking here. 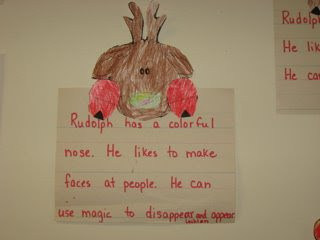 My daughter, Amy, took these photos of some "writings" from Ocracoke School's Pre-K class. She got a kick out of them, and thought you might also. 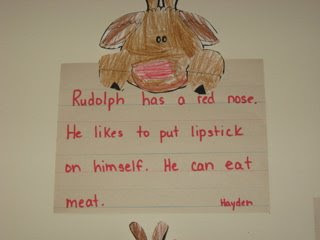 In describing Rudolph, Amy noticed, all of the girls identified Santa's most famous reindeer as female; all of the boys, as male. Last night I took a late evening walk. My thoughts turned to technology -- cell phones, satellite radio, the Internet -- and I was thinking how liberating it would be to give them all up. Simplifying my life would also save me money! But then I was reminded of some of the benefits of modern technology. As our readers know, I publish a monthly on-line newsletter where I share local island history and stories. Last year I published the story of the wreck of the Ariosto which happened on Christmas Eve, 1899. Every now and then I wonder what happened to Captain R. R. Baines, master of the Ariosto, but I've never learned anything more than what I've heard locally about the wreck. Imagine my surprise several days ago when I received an email from Capt. Baines' great-great grandson! He knew little of the Christmas Eve wreck, though he had heard about it, and knew the name of the ship. So he "googled" Baines and Ariosto, and discovered my on-line article. It turns out that he lives in Chile (I believe Capt. Baines was from Antwerp, and his vessel from Great Britain), and he has several pieces of silverware from the Ariosto. He loves history, and is a retired Naval officer, and now a yacht captain. I am hoping he will send me photos of the silverware (engraved with the name of the ship) and of his great-great grandfather. I am also looking forward to learning how his family emigrated to Chile, and any other stories of Captain Baines. So I finally decided that technology, especially the Internet & email, can be very helpful. Without it our grasp of Ocracoke Island history would be more limited. I am now working on a second volume of island history and stories which will include an account of the wreck of the Ariosto. I'm hoping the story will be richer and stronger after corresponding with Captain Baines' descendant. Look for it sometime late next year. Simmer all together for several hours. Orange slices will sink, add fresh ones before serving. This recipe is used for the community gathering each year in mid-December. If you make it at home you will probably want to make a smaller batch, and you might want to add rum, brandy, or bourbon. However you do it, enjoy! And if you're on the island next year in December come join us at the Preservation Society Museum for wassail, carols, and good fellowship. 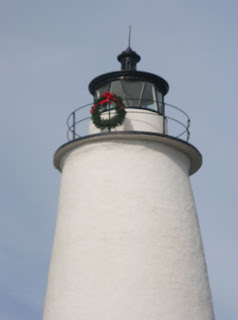 A reader recently asked if the Ocracoke lighthouse has a Christmas wreath again this year. David was kind enough to offer me a photo from the Molasses Creek website. In case you've never been to the island during the holiday season, this will give you a taste for how we celebrate. In other holiday news, the annual Christmas concert, sponsored by the Ocrafolk Festival and Ocracoke Preservation Society was held last night at the Community Center. The building was packed, and, as usual, performances were stellar. There was even participation by a number of the school children this year. Another reader asked about the Ocracoke wassail recipe. I'm sorry but I don't have that. But I will be making some inquiries. As soon as I have it I will share it right here. Tomorrow evening Jimmy & Linda Jackson host their annual community Christmas party at Jimmy's garage. This is one of the highlights of the entire year since just about everyone attends -- old, young, newcomers, natives, Creekers, & Pointers. It begins with a huge pot luck dinner, and includes time to visit with neighbors, share stories, and laugh. After the picnic tables are moved out the band strikes up a tune, and the evening concludes with hours of dancing and good times. A wonderful time is had by all. Back in May I met two very interesting folks, Ann and Tony Ianuario from Jefferson, Georgia. Ann is a direct descendant of Henry Garrish and Elizabeth Howard, two early Ocracokers. For those readers who might be able to make the connection, her great-great-great-grandparents were Josephus Fulcher and Sarah (Sally) Garrish of Ocracoke. Tony is a musician and luthier (he brought one of his violins, and he and David and Jule Garrish entertained us in Blanche's living room). He is also a jolly fellow who sports a full white beard. I couldn't help but ask him if he ever acts as a stand in for old Saint Nick. I was not a bit surprised with his positive answer, but I was totally impressed with the thoroughness of his involvement. This is what Ann told me: "Tony has been "Father Christmas" for 6 years. The director of our local history museum here in Jefferson, Ga. asked him to do it. She rented him a costume. He enjoyed it so much he wanted to continue, so he grew the hair and beard and I got out the sewing machine. Our characters get busier every year." 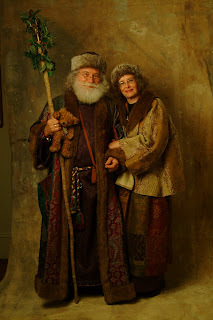 Ann was kind enough to send me a photo so our readers can see the amazing detail they put into their Christmas portrayals. As I mentioned a couple of days ago, Lachlan has never been very enamored of Santa Claus, and in May he declined to be introduced to Tony. But he was curious. Maybe he'll relent on Tony's next visit! I love all of the old trees, especially those on Howard Street. We have several varieties of cedars (some are bright green, some blue-green, others more yellow-green). But the live oaks are the most majestic. Some of the largest oaks grow along Howard Street, with limbs that reach out to almost touch the ground. During Hurricane Isabel several years ago we lost eight or more trees along Howard Street, and it opened up sections of the lane so that it was no longer so tunnel-like in places. Today we are reluctantly having several cedars cut down on the Village Craftsmen property. One medium size tree is leaning so precariously that we're afraid the next storm will take it onto the roof. I've propped it up with long timbers, but I'm sure it wouldn't survive even a moderate hurricane. Several smaller trees are in the way, and will be cleared as well. In addition we're having dead and rotten oak limbs trimmed off (they are also overhanging the building). A pine tree nearby (on Lawton Lane) will also be coming down. Pines are not native to Ocracoke, and are generally the first to snap off during high winds. The trimming and cutting has to be done, and we doubt that you will even notice the change on your next stroll down Howard Street. We hope it will even help the live oaks grow healthier and stronger. It is just barely 50 degrees, but warming up rapidly. The forecast calls for temperatures in the low to mid 60s through Thursday. I think of all the winter weather (snow, ice, sleet, and below freezing temperatures) elsewhere in the country (not that snow in December isn't beautiful, or that Ocracoke doesn't have its own share of less-than-ideal weather -- high humidity, storms, hurricanes, and rising tides)...and I'm thinking this would be a great day for a stroll along the beach! Come on out too, if you're on the island. When Lachlan was 2 1/2 years old he had a too-close encounter with the Easter Bunny. He was warily eying the Bunny (one of the school children dressed up for the annual Easter Egg Hunt) from a distance (I was holding him). Then we were distracted for a few minutes by a neighbor. When we turned around the Bunny was standing just inches from Lachlan's face. From that moment on he wanted nothing to do with anyone in costume (or even a beard). 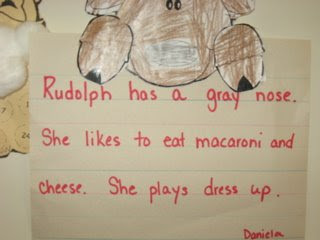 Last year, when Lachlan was three, Santa was persona non grata. I tried to encourage him to embrace (if not literally, at least metaphorically) jolly old Saint Nick, but no luck. 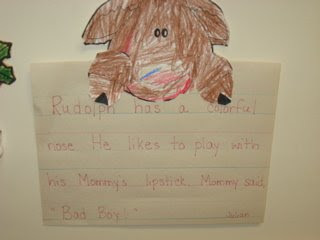 When I explained that Santa brought toys to all good little boys and girls he replied, "I'm a bad little boy!" Then he added, "He's just pretend anyway." At four, things are starting to turn around. Lachlan even donned a mask for Halloween, and I watched as he ran around during the school carnival, not paying much attention to witches, goblins, or even the elaborately made-up "Joker." When a band of 50 pirate re-enactors descended on the village last month Lachlan wanted to go see them, and even stood by entranced as they marched by (decked out in waist coats, capes, & tri-corn hats, with beards, swords, and pistols) just a foot or two away. So this holiday season I think Lachlan is looking forward to a visit from Father Christmas...and I think he might even believe in a little bit of magic this year, too. To read about Philip's new book, Digging up Uncle Evans, History, Ghost Tales, & Stories from Ocracoke Island, click here. Christmas is Coming to Ocracoke! December 6th Pictures with Santa! Santa Claus will be at the Variety Store from 10 – Noon, collecting toys to benefit Hyde County children. Please bring a new, unwrapped toy or $4 to get a photo with Santa. The Ocracoke Preservation Society will be hosting their annual Wassail Party and Community Christmas Tree Lighting from 5 – 7 pm at the OPS Museum. All are welcome to enjoy the hot, delicious wassail and yummy cookies during this free event. The annual Ocrafolk Christmas Concert will be held at the Community Center this year, with free admission. The show starts at 7 pm and will feature local talent including some of our youngest musicians. Everyone is welcome to attend this free event. Ocracoke FOL welcomes you to join them for their annual Cookie Swap at 11 am at the Ocracoke Library. Bring 2 dozen cookies (or more!) to share and take home an equal amount of assorted cookies. Drinks will be provided by FOL, and music will be provided by the Ocracoke School Music Club. Books to Be Red is hosting their 10th annual Children’s Christmas Party at the Community Center from 3 – 4:30 pm . Kids of all ages are invited to come out and enjoy holiday games, crafts and treats at this free event. The kids in grades pre-K through high school welcome the community to their holiday spectacular starting at 7pm in the school gym. Meet at the Methodist Church at 5 pm for Christmas Caroling throughout the village. The church will also host a chili supper for carolers later in the evening. Ocracoke United Methodist Church hosts a “drive-by” Live Nativity scene from 6 – 7 pm. Look for the luminaries lining the road to lead you to the stable. Philip's new book, Digging up Uncle Evans, History, Ghost Tales, and Stories from Ocracoke Island, was published in mid-November. Based on his popular "Down Point" Ghost & History Tour, the book is a compilation of fascinating island history, creepy ghost tales, and other local legends. Click HERE to go directly to BlackSquallBooks.com to learn more, read the first chapter, or place your order. Philip's new book, Digging up Uncle Evans, History, Ghost Tales, and Stories from Ocracoke Island, was published in mid-November. Based on his popular "Down Point" Ghost & History Tour, the book is a compilation of fascinating island history, creepy ghost tales, and other local legends. Click HERE to go directly to BlackSquallBooks.com to learn more, read the first chapter, and place your order.